Haste Podcast: Penny Arcade Switches to Pathfinder, Dungeon A Day, D&D Secrecy. New campaign of the month is here, and a new comic so check them out! Also, be sure to send us any topics you’d like to see us cover – get them in front of us any way you want and we’ll try and cover them! Tonight I’m joined by Enrique Bertran aka @NewbieDM from the ENnie nomiated blog newbiedm.com and creator of RPG Kids! He’s celebrating the one year anniversary of RPGKids and so it’s on sale right now at RPGnow for 99 cents, if you have little one’s and you’ve not done so already now is the time to pick it up! Also, we’ve got a chance for you guys to win a copy of Unhallowed Metropolis going on, that ends this Thursday and also the d20Monkey caption contest ends this Sunday – so get cracking, we really want you to win some free stuff! This month we interview HoptownGameNight (aka Justin Mason) about his ongoing game night campaign “From Beyond The Shattered Gateway” in all of its marvellously decadent presentation. Long time advocate of Obsidian Portal, Justin claims the title of having the first ever “Campaign of the Month” from way back in 2008 so it’s nice to have him back again. Haste – Episode 1: Pathfinder Mini’s and More! 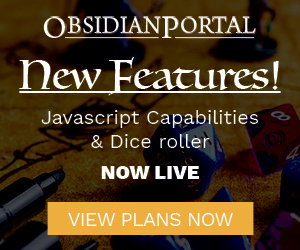 A little PSA before the headlines, Obsidian Portal is getting prepped and ready for GenCon this year with our first ever set of seminars and more that’s yet to be revealed! Stay tuned to our Official GenCon 11′ blog post for up to the minute developments of all our GenCon attractions! I’ll admit right off the bat, I was never one much for tabletop gaming magazines. Not really sure why, maybe it was my assumption that they were all horridly laid out or that a mixed bag of systems/games I’ve never played in wouldn’t appeal to me. I also kind of thought of the content to be amateur-ish and always convinced myself I’d much rather have something straight from a game publisher – official books, modules and supplements rather than something ‘joe schmoe’ came up with. Boy was I wrong about all of those things.